A Cambodia's senior education official said Wednesday that Chinese language schools have been mushrooming throughout Cambodia and the language becomes the second most popular foreign one in the country after English. 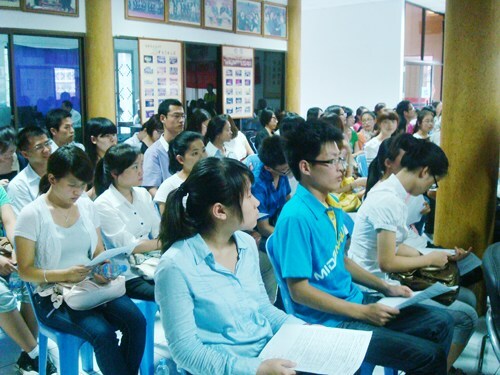 Chinese language schools have been mushrooming throughout Cambodia in recent years. In the picture China sends second group of teachers to Cambodia to teach Chinese language on August 6-7, 2011. "I observe that more and more Cambodian children flock to study Chinese language nowadays," Chey Chab, secretary of state for the Ministry of Education, Youth and Sports, said Wednesday during the inauguration of the Beijing International Academy (BIA) in Phnom Penh. "I see that Chinese language has been broadly used internationally now and it looks more important, especially among business communities," he said. Chab said that in Cambodia, the language has gradually been gaining popularity as China is the country's largest investor and a leading trade partner with Cambodia. According to the Chinese Association in Cambodia, there are 56 Chinese schools with more than 30,000 students throughout Cambodia. The figure does not include local private schools that offer part- time Chinese language courses. Diana Liu, the BIA's director, said the BIA was the first academy in Cambodia that offered Chinese and English programs with complete combined programs including arts, cultures, sciences, music, dance and martial arts. "We are committed to building an excellent quality of Chinese and English education in the country," she said. "Our presence here will also help the government of Cambodia to develop human resources." Mandarin becomes popular language course for U.S. students.